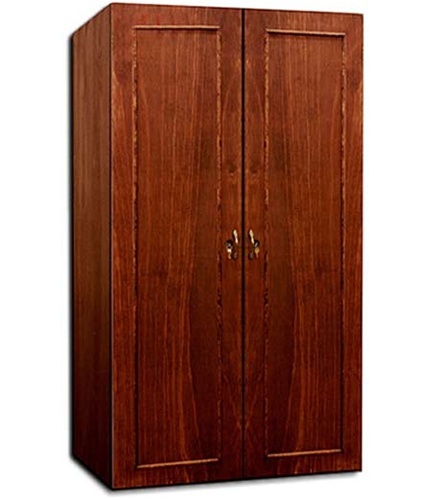 The Galaxy 340 shown with American Walnut stain finish on Mahogany wood. Recommended for functional purposes such as garages, basements, spare rooms, etc. Door Type - Veneer-panel frame. Equipped with antique brass grapevine handle(s). We can install your handle(s) at no charge. Racking - Unfinished Universal Redwood racking plus top bulk storage, click here to view. ventilation. Click here to view. * Bottle count is based on all standard 750ml, Champagnes, Magnums & includes bulk storage. Wood & Stain Color - Exterior available only in American Walnut stain finish on Luan Mahogany wood. 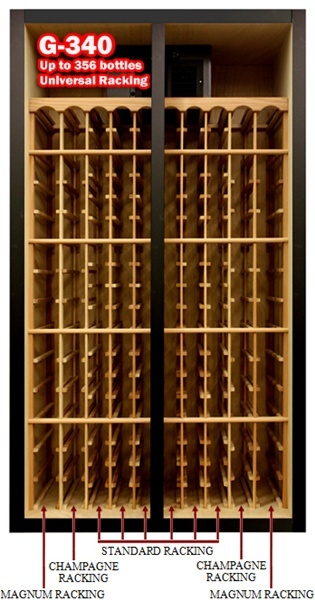 standard 750ml at 3½" opening, 2 columns of Champagne racking at at 3¾"
opening, 2 columns of Magnum racking at at 3½" opening. Click here to view. 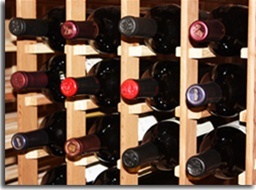 750ml fits most Bordeaux, Chardonnay, Pinot, and Burgundy bottles at 3¼" diameter. The Rack are strong enough to hold 3L and 6L (for most models) at the top bulk storage. Allow 4 weeks standard production. Contact us for rush production or custom orders.